John Clark on the start of planting season. Kate and I share an interesting heritage. Dad had a degree in horticulture from the Stockbridge School at U. Mass. Mom began writing about food and gardens when we were little. She went on to become a pretty slick gardener and was a member of the Garden Writers of America. We grew up on a chicken farm, but there were numerous gardens, a blueberry field, an apple orchard and a rhubarb patch. 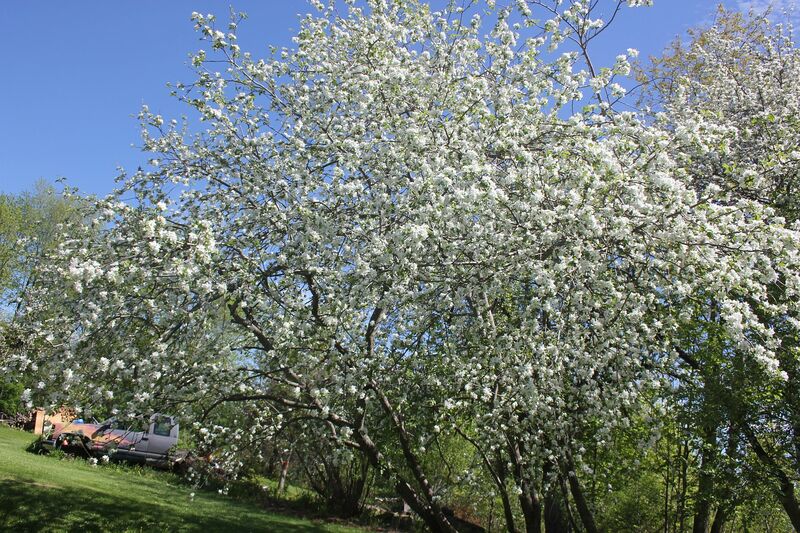 Even after the most aggressive pruning yet, the apple trees are loaded with blossoms. I disliked gardening as a kid, mostly because it usually involved me pulling weeds. I do remember the fun of standing on the seat of Dad’s Farmall Cub tractor so I could reach the higher branches on our two sour cherry trees. After Beth and I got married and bought our own house in Chelsea, I tackled the wasteland that passed for a back yard and created a garden. It was a slow process, given all the rocks, ledge, broken glass and rusty metal out there, but over time it became a pretty decent spot. We added grape vines, apple trees, a plum tree, rhubarb, butternut trees and a cherry tree. 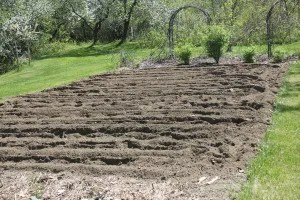 In 2003, we moved to Hartland and one of the conditions for buying the house was that I could bring my tiller and start a garden before the closing . The woman who sold the house to us had a flower garden, but was fine with our turning it into a vegetable garden. We moved the perennials to another flower garden or gave them away and ended up with a fairly good first garden. Our lower garden ready for planting with Honeyberry bushes and grape vines in the background. Each year since then we’ve improved the soil, expanded the size a bit and added trees and vines to the back yard. Our one acre is extremely productive. Mature apple trees line the boundaries and we’ve come to recognize which bear the best apples. Three stand out, an early Macintosh, an unknown early yellow and a small dark purple that ripens later than any of the others. 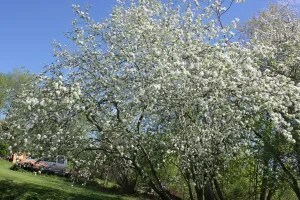 In addition, we have two Stanley plum trees that started bearing heavily last year, several grape vines that got special attention last summer and are pruned and bound in preparation for this year, two pear trees and three pie cherries. We also have some unusual fruiting critters. There are two Shadbushes, close to a hundred gold and red everbearing raspberries and a couple hardy kiwis that haven’t decided whether they plan to survive. The most intriguing plants are five Honeyberry bushes that all have fruit on them. They’re an edible variety of the Honeysuckle family, hardy to 55 below and fruit before strawberries. We’re eager to see how they taste. We’ve already enjoyed asparagus and rhubarb. Two years ago, I took over tilling and weeding of my neighbor Larry’s garden when he became unable to work it. I shared it with Nate and Darcy, a young couple living beside Larry. They’re expecting their first child in July, so they ceded the garden over to me for this growing season. In essence, this doubled our garden space. 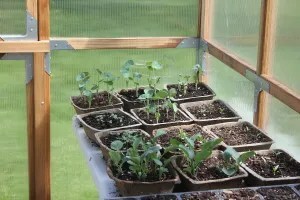 That garden has potatoes, dry beans, onions, peas, pumpkins, old parsnip seeds and an attempt to start red cabbage outside of my greenhouse. 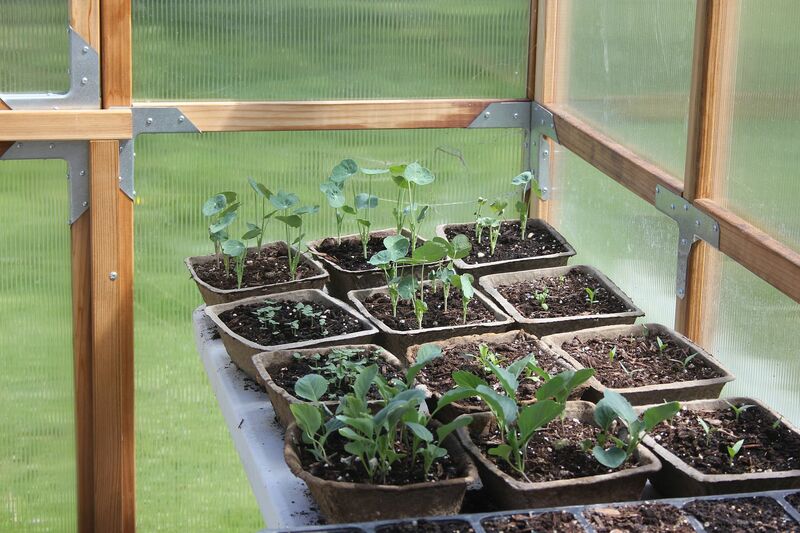 I left room for spillover crops and it looks like cauliflower and cukes will fill that space. 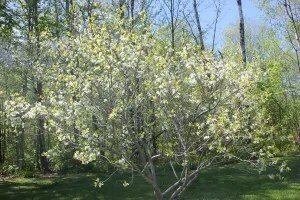 Plum tree with more blossoms than leaves. In our garden, you’ll find 5 small raised beds filled with new sifted compost (Beth worked hard to get our monster compost pile mounded up with plenty of compost enhancer on it so I could run the tiller around the pile before sifting the good stuff) More onions, radishes, carrots, turnips and two kinds of beets will grow in them. Some of the reasons I love my greenhouse. Green beans, soy beans, more parsnips, corn, lettuce, tomatoes, Brussel sprouts, peppers, green cabbage, broccoli, cauliflower, yellow squash, zucchini and two varieties of winter squash round out the planting in this garden. If all goes right, we’ll be enjoying the bounty from mid July through October before starting on stored and frozen stuff to get us through the winter. There are plenty of flowers, too. 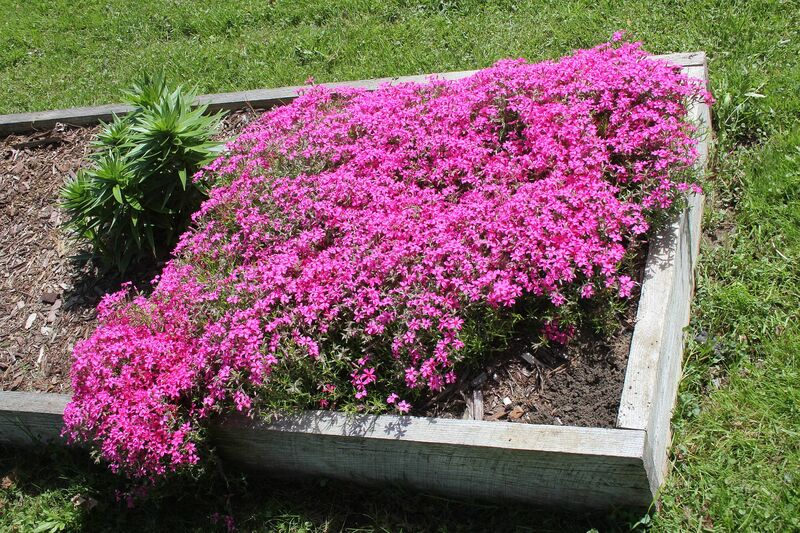 Can you believe these were scrawny transplants at this time last year? No two gardening years are the same. This one has been rather damp and chilly so far. Remembering what each year has brought in terms of successes and disappointments always leaves me in awe of those hardy souls who had no choice a couple hundred years ago. A bad year meant life got real serious, real fast. Stay tuned for a fall followup and feel free to share your garden plans and adventures. 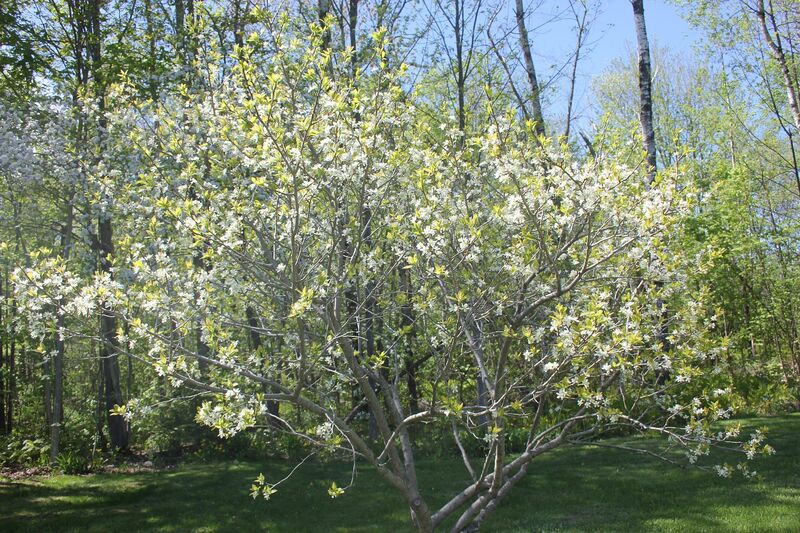 This entry was posted in John Clark and tagged apple trees, Cherry trees, Everbearing raspberries., gardening, Hartland, Honeyberries, John Clark, Shadbush, Spring planting. Bookmark the permalink. WOW…my folks always had a garden and I grew up going out to the garden and helping myself when I wanted a snack. Warm from the sun tomatoes – YUM…I have not been able to have a garden since, but do shop at our Farmer’s Market. Love this post! Garden on! I’m in awe of your diligence! Thanks folks, now to stay ahead of the weeds.